I always love it when new things start coming into UY, getting ready for knitting season. While it’s only June for a little longer, September and cooler weather is only a few months away! 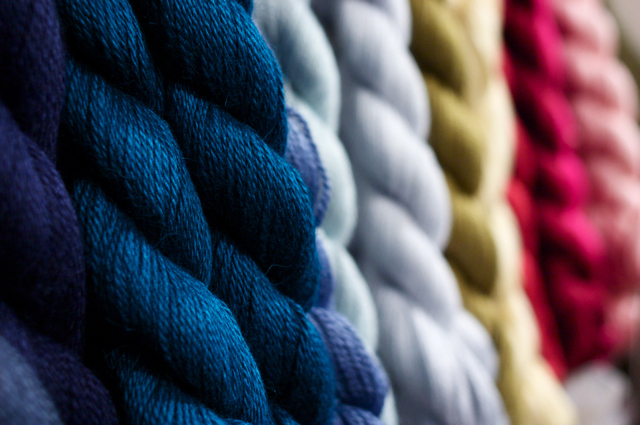 That being said, we’ve had some great new colours and yarns piling into the shop. The Uplander Pullover is a bulky men’s sweater, perfect for the rugged outdoorsman. It takes 11-15 skeins of SnC Outer and will knit up in a jiffy at that weight. If you’re in the mood for a smaller project there is always the Little Man Vest, 3 skeins of outer and oh so cute. For Sweater we’ve got the new Flower Power Throw pattern. It’s a beautiful groovy blanket and with all the colours, there is sure to be a combination for you. If you’re in the mood for some luxurious alpaca, we have also received new colours in Blue Sky Alpaca Sport and Melange, one of my very favorite yarns. I’ll be starting on Olga’s Mittens tonight! As you may know, I have quite a penchant for Fair Isle mittens and these beauties fit the bill to a T.
Blue Sky has also come out with a couple of new patterns for their Brushed Suri. It’s a pretty fuzzy yarn that is super soft but I’ve been at a bit of a loss for what to do with the lovely yarn. Not to worry, there are 2 cute new patterns for the Brushed Suri, the lacy Brushed Suri Wrap and the Brushed Suri Tunic. So stop by and check out the new Blue Sky and Spud and Chloe yarns as well as others that have been flowing into the shop! This entry was posted on Friday, June 25th, 2010 at 10:37 am	and is filed under Uncategorized. You can follow any responses to this entry through the RSS 2.0 feed. Both comments and pings are currently closed.